As of Jan. 1, 2019, the Mission’s Elbo Room will be no more. It will slip into the realm of memory and legend, another venue undone by the high-value real-estate game that’s unraveling San Francisco’s cultural nerve centers. The musicians who played there will remember it fondly. Mission born-and-bred trumpeter Mario Alberto Silva was one of hundreds who cut his teeth at the Elbo Room. Back in the late ’90s, Silva recalls, it was the spot to get a gig at. If you were a musician in the Mission, you strived to get booked there, and you knew you were winning big once you played. And for the ones who did, the Elbo Room would become a home away from home, where musicians would gather and enjoy music. “For a while, it felt like I knew everyone who was performing there,” Silva said. Silva, who is releasing his first album next year, said the Elbo Room was a favorite place to meet other musicians and jam together. He had his first gig there in 1998, and was able to walk up and join a band on stage. From then on, he said, he would sometimes show up and get invited to sit in and and give bands some support, and improvise and jam to a live crowd. It became one of many of his preferred moments. His other favorite time at Elbo Room? Carnaval after-party. Rafael Bustamante Sarria, lead vocalist for La Gente SF, was at those parties, too. Those were wild nights, he recalls, where 30 musicians would jam for a packed crowd. The Elbo Room held that reputation for Mission natives as a place where cholos, dancers, and taggers would all gather to groove and enjoy live music. To Bustamante Sarria, no other venue would compare: Others were too small or too big, or had limits on what music genres could be played. 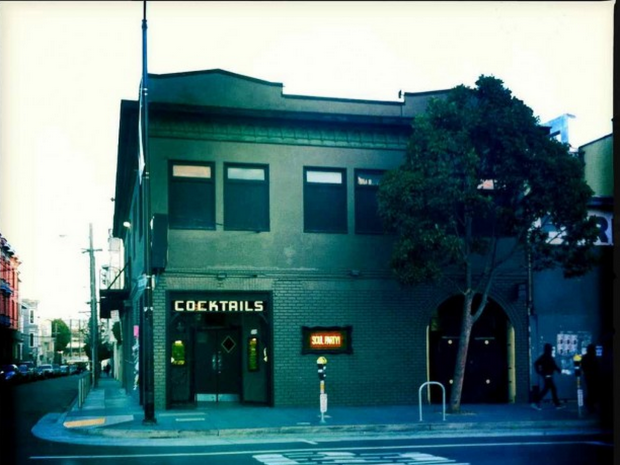 “The Mission District was our home base, and the Elbo Room was the one place that we could lean on. It still was dependable, and it felt like the old Mission,” he said. He and others hope to keep the party going at the Elbo Room’s new Jack London Square location in Oakland, where the same owners will operate the venue. La Gente SF has a show there in February. But, for the Mission, its musicians, and its fans, yet another vestige of the neighborhood is decamping to Oakland. What musicians enjoyed so much about the Elbo Room in the Mission was the freedom its owners gave to musicians. Cover prices and door sales were split in favor of the musicians, Bustamante Sarria said. If you were a performer, you were made to feel welcome — and if you had an idea for a show, you were given the go-ahead before you reached the end of your elevator pitch. “Elbo on a Friday night, we walked away with money in our pockets. That’s just hard to find, man,” Bustamante Sarria said. Literary Death Match, 2009 from Mission Local on Vimeo. City native and local rapper Alex Fraknoi, also known by his rap alias Frak, organized underground rap shows at the Elbo Room that brought in rappers from all over the Bay. It served as a place for locals and natives to congregate, especially since many had had their first legal drinks at the Elbo Room to begin with. “Venues out there charge a lot, but the Elbo Room was happy to let us do our thing,” Frak said. In 1996, Sep Ghadishah, a radio disc jockey under the alias of DJ Sep, saw an opportunity to bring dub and reggae into the city’s dance scenes. She launched Dub Mission, which continued at the Elbo Room as a weekly show for 19 years. The constant threat of the venue being sold, then getting a reprieve, and then nearly being sold once more put a strain on many promoters. Some ceased doing weekly shows, or even monthly ones; according to Ghadishah, most will only do one-offs. Julian Gervasi, lead singer and songwriter for Loco Tranquilo, who lives in the Mission, played five shows there over a three-year period. He’ll continue to support live music in the Mission, but finding a replacement home venue will be difficult, he said. “Every memory there was a good memory, man,” Gervasi said. Thank you Matt and crew for so many good years. I had the privilege of playing The Elbo Room several times and celebrated many birthdays there. I had my last cocktail there about an hour into 2019 and it was wonderful. We will miss you all.